Grazing incidence diffraction techniques (i.e. GIWAXS / GISAXS), but also X-ray diffraction (XRD) and X-ray reflectivity (XRR) is used in our group for the structural characterization of thin films produced by different coating techniques like doctor-blading, spin-coating and Langmuir-Blodgett. These techniques are well suited for the preparation of different film types and thicknesses: from molecular monolayers to complex films of thicknesses beyond 100 nm. In our group the location of antimicrobial peptides and membrane proteins in phospholipid membranes is of particular interest. For this purpose we study multi lamellar phospholipid thin films which serve as a model system for biological membranes. Low concentrations of antimicrobial peptides are known to cause defects in the lipid layers. For higher concentrations some peptides form pores through the membrane. These structural changes are still not fully understood and are of significant interest in medical and biological research due to the high potential of antimicrobial peptides as an alternative for antibiotics. A detailed analysis of the molecular structure of the thin films is achieved from ex-situ measurements with very good signal to noise ratio. These experiments can be performed with our in-house SAXS/GISAXS and XRR instruments. In addition we are highly interested in thin film formation and degradation processes. 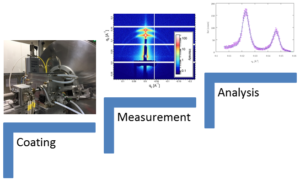 For this purpose highly time resolved measurements (100 ms) are performed using a portable doctor-blading cell with temperature and humidity control at beamlines of synchrotron sources such as PETRA III (DESY, Hamburg) or ESRF (Grenoble, France).